Meryl Streep and Hollywood: Champions of the Disabled? Or Cowardly Hypocrites? 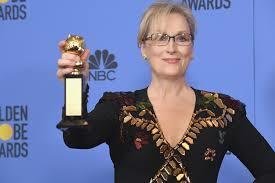 Meryl Streep gave what many considered a brave and courageous speech at the Golden Globes Sunday evening January 8th 2016 after receiving her Lifetime Achievement Award. Meryl Streep’s advocacy for the respect and protection of those with disabilities is certainly admirable. However, are Streep and her Hollywood colleagues willing to step out of their left-wing bubble and look at the rights of a large group of extremely vulnerable disabled individuals? It’s no secret that Streep and Hollywood are pro-abortion. If she really wanted to address the violence against the disabled, and not just score some cheap political points with her fellow Hollywood glitterati, Streep could have asked her audience to consider just how those later term abortions “terminate” a disabled child. Ok Meryl. I have some ideas for you and your Hollywood friends. How about a TV series or movie that shares a compelling story of the challenges and triumphs of a Christian couple who defied the pressure of medical professionals who counseled them to abort their disabled child – and instead gave that child life? Maybe create a Netflix show telling us how a couples abortion of a disabled child impacted their lives and the amazing emotional and spiritual healing they found in an abortion recovery program? Now that would be brave and courageous! This entry was posted on Tuesday, January 10th, 2017 at 4:33 pm	and is filed under Uncategorized. You can follow any responses to this entry through the RSS 2.0 feed. You can leave a response, or trackback from your own site.